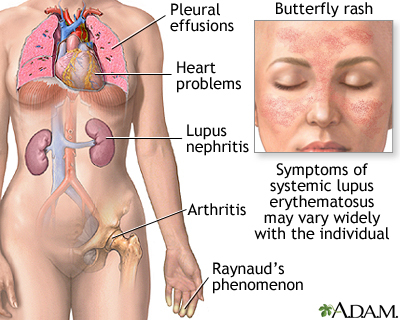 Systemic lupus erythematosus is a chronic inflammatory autoimmune disorder which may affect many organ systems including the skin, joints and internal organs. The disease may be mild or severe and life-threatening. African-Americans and Asians are disproportionately affected. Reviewed By: Gordon A. Starkebaum, MD, Professor of Medicine, Division of Rheumatology, University of Washington School of Medicine, Seattle, WA. Also reviewed by David Zieve, MD, MHA, Isla Ogilvie, PhD, and the A.D.A.M. Editorial team.